The pursuing soldiers commandeered a car when they were unable to catch the man on foot, but he was eventually caught by a passing cyclist who responded to the soldiers’ calls to stop the spy. However, although the man was arrested, he was released without charge when he turned out to be a respected Kildare cattle dealer named Murphy. It is unclear why Murphy expected that expressing his view to British soldiers “that the Kaiser might smash the British army and dominate the world in the end” would be uncontroversial, even though such views were common among militant nationalists and radical labour activists (“‘Stop Spy’ in Dublin Streets”). Evening Telegraph 15 Mar. 1915: 2. What is interesting, though, is that the expression by an Irishman of such anti-British sentiments led him to be labelled a spy. Indeed, this story fitted into a discourse on spies and spying spread by newspapers and other popular media including the cinema that dovetailed with the British government’s war policies (see also, for example, in same issue of Evening Telegraph “Imaginary Spy” and “Danger of Spies”). For three days in mid-March, Dublin’s Dorset Picture Hall showed In the Grip of Spies (Britain: Big Ben, 1914), and this title offers an apt description of the state of fear of “the enemy among us” that this discourse aimed to spread. “From end to end of the British Isles they are talking of the German Spy menace,” a press ad claimed. “This Film deals with the theft of a naval Code Book, which is equivalent to saying that it is of absorbing interest at the present time” (ibid). But spying was also a suitable subject for comedy, with patrons at the Picture House, Sackville/O’Connell Street enjoying Wiffles Catches a Spy (France: Pathé, 1915). In general, however, the discourse on spies and the cinema was not comic. Spies brought the war even closer to Ireland and Britain than the German naval blockade blockade to which this ad linked it. Suspicion could be cast on anyone who used a film camera, which purposely or inadvertently could provide intelligence for German attacks. Echoing an incident in Dublin in September 1914 when Norman Whitten was threatened with being shot for filming troops embarking at Dublin port, an article in the Evening Telegraph in early March 1915 reported from the Gateshead Police Court on the arrests, fining and confiscation of the footage of Stanley Dorman and Edwin Joseph Jennings who had filmed a Tyneside naval installation without permission (“Film of a Warship”). We Serve Neither King nor Kaiser banner and its removal from Liberty Hall in Evening Herald 21 Dec. 1914: 1. At the start of the war, a banner proclaiming “We Serve Neither King nor Kaiser, But Ireland” was erected on the facade of Liberty Hall, headquarters of the labour movement, and it was only removed by soldiers and police in December 1914 (“‘Liberty’ Hall”). Earlier that month, such radical papers as the Irish Worker, Sinn Fein, Irish Freedom and Eire/Ireland were suppessed (“Irish Papers,” “Another Dublin Paper”). By contrast, the British trade press continued to urge the wider use of cinema in support of the war effort. In the face of opposition by reformers unsympathetic to popular culture and by the churches to Sunday opening, the industry aimed to win wider social acceptability by aligning itself with state policy. For the Bioscope, cinema certainly played a crucial role as rational recreation at a time of great collective stress. An editorial in March 1915 rejected the snobbish “reproach on those who seek relaxation in theatres and music halls” and argued that “the cinemas are playing no mean part in providing the great mass of people with innocent and healthful entertainment” (“Amusements in War Time”). However, it could also play a much more active role in shaping public opinion in support of the war, a point that the trade papers had argued from an early point in the war. In September 1914, for example, the Bioscope had praised the views of Liberal politician Sir Henry Norman, who in a letter to the London Times had emphasized the role that battlefield reporting could play in support of recruiting and arousing enthusiasm for the war at home. Norman proposed sending to the front with the correspondents “at least one official cinematographer, whose films of the glories of war – we shall have plenty of other means of learning of its sorrows – should be shown in every town and village in the land” (“The Cinematograph at the Front”). Dublin Evening Mail 27 Mar. 1915: 5.
a cinema theatre in Trieste has been showing pictures of the campaign in Serbia which are intended to be patriotic, but which unconsciously reveal revolting atrocities committed by Austrian soldiers. Once the authorities realized what the films depicted, they destroyed them. 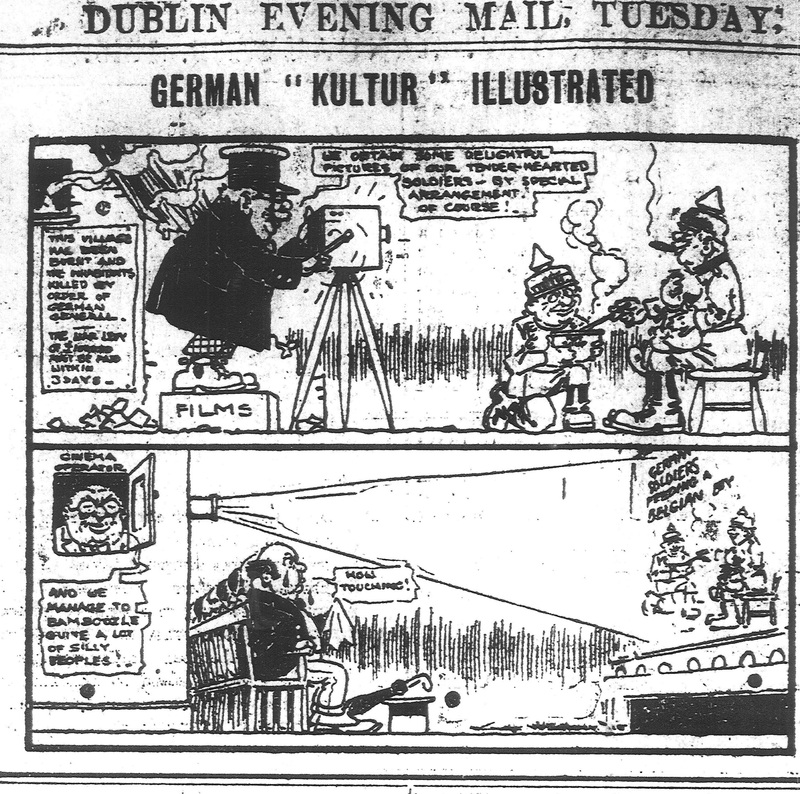 Cartoon showing the shooting and exhibition of a German propaganda film; Dublin Evening Mail, 19 Jan. 1915: 3. The dominant story that the mainstream and cinema trade press in Ireland and Britain told about enemy propaganda concerned its untruthfulness. This was well illustrated in mid-January 1915 when the Dublin Evening Mail published a cartoon depicting how adept the German film industry was in keeping from the German public the realities of their army’s depredations in Belgium. Its two panels showed how a German filmmaker conspired with the German army to produce a faked film of soldiers helping vulnerable Belgian citizens, and how this film influenced public opinion in support of the war when exhibited in cinemas. The title of the cartoon – “German ‘Kultur’ Illustrated” – seemed to carry a criticism of cinema in general in suggesting that German culture should be associated with such a low form as cinema. a young Irish lady and a member of the theatrical profession, who, after being held a prisoner for several months, has recently succeeded in escaping from the enemy’s land, where she was staying at the outbreak of war. The efforts of the industry and its supporters would soon convince the British government about the power of the cinema propaganda. Despite the prominence of such Irish people as Norah Mahone, however, these kind of films would always prove to be controversial in Ireland. “Amusements in War Time.” Bioscope 11 Mar. 1915: 875. “Another Dublin Paper: Suppressed this Morning.” Evening Telegraph 5 Dec. 1914: 3. “Atrocities on the Cinema: Austrian Films that Told Too Much: Destroyed by Authorities.” Dublin Evening Mail 27 Mar. 1915: 5. “The Cinematograph at the Front.” Bioscope 3 Sep. 1914: 859. “City Sensation: Arrest by Military: Man Pursued: By Motor and Cycle.” Evening Telegraph 16 Mar. 1915: 3. “Danger of Spies: Stringent Regulation: Of Traffic with Holland.” Evening Telegraph 16 Mar. 1915: 4. “Film of a Warship: Drastic Action by the Authorities.” Evening Telegraph 4 Mar. 1915: 1. “A German Allegorical Film Play: An Irish Actress’s Remarkable Experience in Germany.” Bioscope 18 Mar. 1915: 1021, 23. “Imaginary Spy: Exciting Chase in London: Dublin Fusilier Sent to Jail.” Evening Telegraph 16 Mar. 1915: 3. “Irish Papers Suppressed by the Government: Defence of Realm Act: Instruction by Military: Copies Seized and Printers Warned.” Evening Telegraph 3 Dec. 1914: 3. “‘Liberty’ Hall: Troops and Police Remove a Motto.” Evening Herald 21 Dec. 1914: 1. “Our Duty in this Crisis.” Irish Worker 8 Aug. 1914: 2. “‘Stop Spy’ in Dublin Streets.” Irish Independent 17 Mar. 1915: 5. Unlike the experience in an Irish picture house in 2015, the cinema audience a century ago expected to share the auditorium not only with other spectators but also the musicians and – often – variety artistes who were responsible for producing a considerable part of the entertainment live. On 4 February 1915, the Ulster correspondent of the cinema trade journal Bioscope began his/her regular “Jottings from Ulster” column in fairly typical fashion by praising the attractions available at Provincial Cinematograph Theatres’ Picture House, Royal Avenue, Belfast. The attractions included the pictures Marguerite of Navarre (France: Pathé, 1914), Nick Winter in the Wild West (US: Eclectic, 1914) and The Bond of Love (US: Selig, 1914), which were accompanied by an “orchestra [that] has been considerably augmented.” The music produced by the musicians in the cinema was not the only part of the show produced live because “the monotony of all pictures is delightfully relieved by Mr. Norman Williams, who sings every afternoon and evening.” While the orchestra was expected to accompany the pictures and increase their attractiveness by augmenting them, Williams’ singing was a separate feature of the programme and was used – according to Jottings, at least – to ensure that audiences would not be bored by a programme that just consisted of films. Part of the programme at Dublin’s Star Theatre of Varieties at which the first films in Ireland were shown in April 1896. The claim here is worth lingering on because it implies that variety was a necessary part of the programme, and in this case, the necessary variety was based on the differences between live and recorded performance. Variation in the length and genre of films has already been discussed in other posts, but here variety refers to the kinds of live performance – singing, dancing, comedy, juggling, acrobatics and animal acts –with which audiences a century ago would have been intimately familiar from the variety theatre. The variety theatre or music hall had been one of the first places at which moving pictures were exhibited, and the notion that popular entertainment should offer a variety of attractions persisted long after dedicated picture houses first appeared, which in Ireland was the late 1900s. Before this, in the 1890s and 1900s, variety theatre had added film as another of its acts or “turns,” and in the 1910s and for a long time thereafter, some picture houses included not only a variety of film attractions with musical accompaniment but also live variety acts. In fact, given the existence of the mix of film and variety entertainment at such large venues as Dublin’s 4,000-seat Theatre Royal until the 1960s, cine-variety should be considered one of the country’s most persistent forms of entertainment. In early 1915, in any case, some – but by no means all – Irish picture house owners and commentators recognized the economic and aesthetic benefits of presenting variety alongside film. The cinema trade was not unanimous on whether or not variety turn in cinemas was a good or necessary thing. 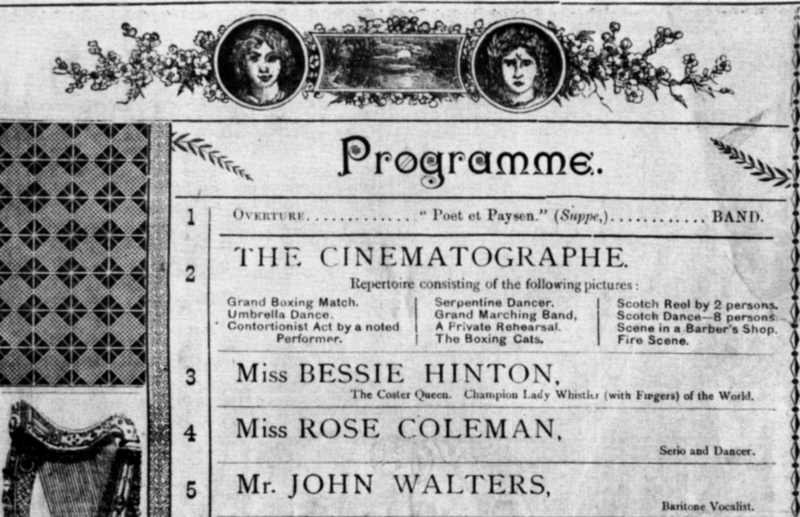 The Bioscope had long considered the importance of variety in Britain to be confined to the provinces, commenting in an editorial in 1911 that it was particularly associated with “the Midlands and North of England, where at least in a great many halls, the programme is not considered complete unless two or three variety turns are included” (“The All-Picture Programme”). This still seems to have been the case in 1914-15, when the early months of the war saw a decline in music-hall business (“Variety Turns”). Because of falling audiences, music-hall owners faced with closure made a deal called the “Fifty and Fifty” with the Variety Artistes’ Federation in late 1914, agreeing to split box office receipts evenly between artistes and venues (“Variety Artistes”). The picture houses were not favoured with a deal. A meeting of the Variety Artistes’ Federation passed a resolution that “no scheme for the deduction of salaries be granted to picture theatres engaging variety artistes, and that full salaries be demanded” (ibid.). Nevertheless, Jottings pointed out that “[v]arieties are very steadily creeping into the motion houses throughout Ulster to-day” (“Jottings,” 28 Jan.). At the end of January, Norman Williams at the Picture House, Royal Avenue was joined by “Miss Ruth Vollmer, Scotch comedienne, dancer and clever exponent on the Scotch pipes, [who] was the star attraction at Lisburn Palace” (ibid.). However, once Charles Bronson took over management of the Palace, Omagh, he relied on films alone to draw the audience rather than the variety turns favoured by former manager Alex Cockle (ibid.). At the end of February, Jeanne Bal and Eugenie Van Camp – “two Belgian refugees” – appeared at the Picture House, Regent Street, Newtownards, where the “rendition by Mdlle. Van Camp of ‘Tipperary’ is very pleasing” (“Jottings,” 4 Mar.). The other Newtownards cinema, the Picture Palace, had four variety acts, so that “one would not know whether to refer to it as a cinema with varieties, or as a music-hall with pictures” (ibid.). While the inclusion of variety acts in a picture house programme appeared to put more emphasis on the live aspects of cinema and the associated possibilities for local variation, the appearance in Ireland in early 1915 of technological developments in film sound and colour suggested that a complete cinematic experience could be supplied by the recorded artefact alone. Colour film technology was to be seen from 8-13 February at the matinees of Dublin’s Theatre Royal, which hosted a return of the Kinemacolor war films The Fighting Forces of Europe, which had been first seen in Ireland the previous November. The return visit came with the added publicity of royal command performances in London, and the first show in Dublin was attended by the Lord Lieutenant and Lady Aberdeen. The Aberdeens would themselves leave Ireland in late February, and their departure was filmed by Pathé and by local exhibitor I. I. Bradlaw and local topical specialist Norman Whitten (Paddy, 25 Feb.). In any case, the Kinemacolor war films were one kind of technological development of cinema but they were not self-explanatory and so needed to be “fully described by an interesting lecture given by Mr. John Doran, and a special orchestra under the direction of Mr. Allan Blackwood, the well-known conductor” (“War Pictures”). Edison’s Kinetophone 1914-15. Irish News 23 Mar. 1914: 8 and Evening Telegraph 25 Jan. 1915: 3. The film sound technologies on exhibition in Ireland in early 1915 offered the possibility that lecturer and orchestra could be dispensed with. 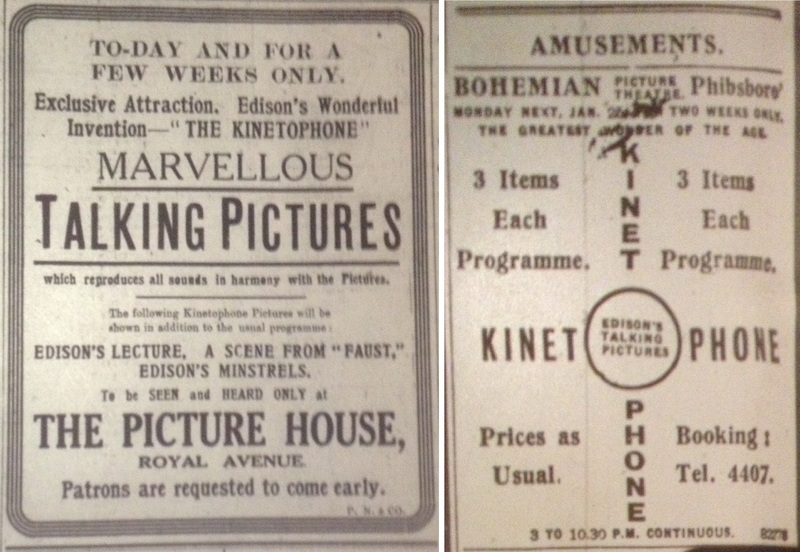 In late January, the Edison company’s Kinetophone talking pictures, which had had their first Irish appeared in Belfast the previous March, opened for at two week run at Dublin’s Bohemian Picture Theatre. “The success of this the latest addition to the attractions of the popular Phibsboro’ House,” observed the reviewer in the Evening Telegraph, “was from the start most marked, and the display, which last night included a musical sketch entitled ‘After College Days’ and Edison’s Minstrels, immediately appealed to the hearty enthusiasm of the very large audience” (“The Bohemian”). However, the Kinetophone items did not even nearly fill the programme but had to be supplemented by three reels of The Barefoot Boy (US: Kalem, 1914), the Pathé Gazette newsreel and comedy The Great Toe Mystery (US: Keystone, 1914). A full programme of talking-and-singing pictures was still some way off. Licensing was one reason that picture house owners might have wished to have fewer live elements to deal with. Live music, and particularly the live singing of a variety artist, required entertainment venues to have a music-and-dancing licence. The reasons for this were made clear in late February 1915, when the latest proceedings were heard against a Dublin picture house, in this case, the Dame Street Picture House, that the city authorities claimed needed not just a cinematograph licence – which was mainly designed to ensure fire safety – but also a music-and-dancing licence. 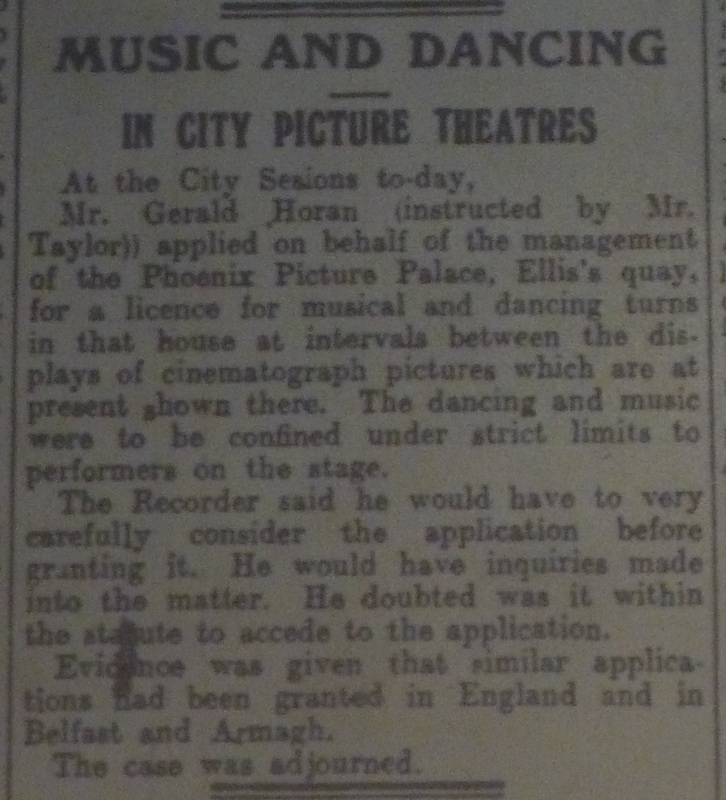 A related case against the Electric Theatre, Talbot Street had concluded in December 1914 with the prosecution of that cinema for not having a music-and-dancing licence (“City Cinemas”). The case against the Electric Theatre was apparently more straightforward because at the Electric’s evening performances, the pictures were accompanied not only by the piano that was used earlier in the day but also by a violin and cello. As a result, Justice Mahony had decided that the Electric’s claim that music was subsidiary to the entertainment was not sustainable. Although the case against the Dame was also due for decision, it had been adjourned because at the Dame only a piano was used to accompany the films. These cases offer some fascinating details about the nature of live musical accompaniment at these relatively small picture houses at this period. Neither of them employed variety acts, and the musical accompaniment was the main kind of live supplement to the recorded images. While such larger picture houses as the Rotunda and Bohemian made a feature of the live music they offered, naming the musical director in advertising and at least on occasion, mounting special musical entertainments, these smaller venues downplayed the role of music to their entertainment. At least they did so in the context of this court case, which was part of a legal strategy to avoid having to pay for a music licence and/or pay a fine. The Electric’s argument that music was subsidiary was judged unbelievable because the judge concluded that the music was not just used to cover incidental noises in the cinema. Although the newspaper accounts do not state this explicitly, this was clearly true because the Electric augmented the music at the evening entertainment by the inclusion not just of louder music to cover the increased noises of a larger audience but of two instruments that enhanced the musical range of the performance. This offers a vivid image of the kind of challenges picture-house musicians faced. It did not, however, convince the justices on the King’s Bench, who voted a 2-1 majority to affirm the magistrate’s decision that the music at the Dame represented a separate attraction that required a licence. Even if part of the function of music in the picture house was to “drown the noise” of early cinema’s supplementary live soundtracks, it also provided an aesthetic experience in itself, if not a layer of acoustic interpretation of the pictures on screen. Evening Herald 3 Feb 1915:3. War-themed subjects remained among the most popular of the pictures on screen. 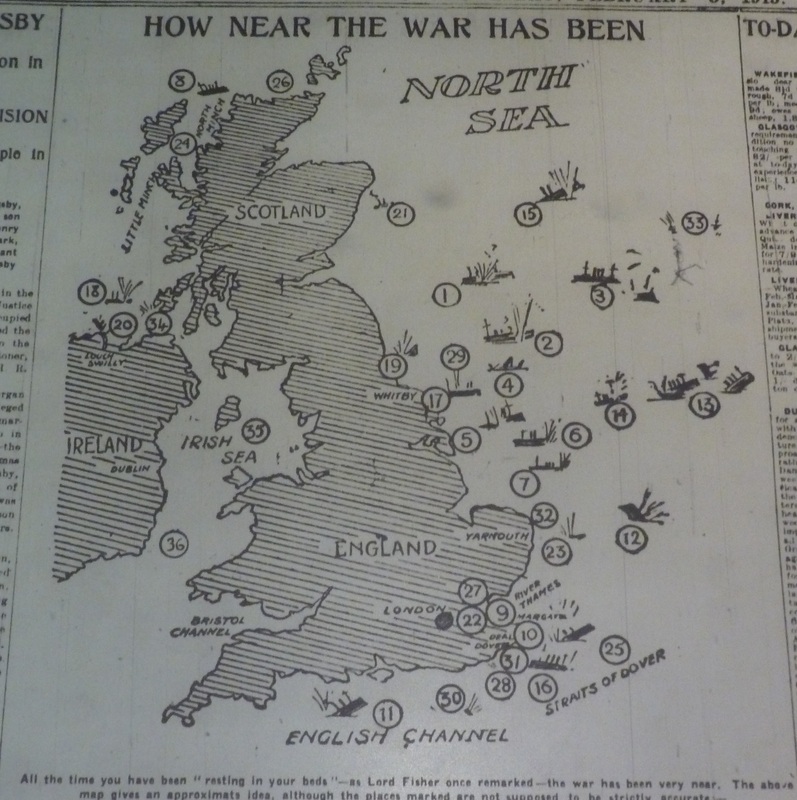 How films provided an alternative forum in which to think about current events was shown when the Evening Herald printed a map of the war at sea around the coasts of Britain and Ireland, emphasizing the proximity of the war. Although much of this action was located in the North Sea, German submarines attempted to cut the transatlantic supply lines to Britain. The Lusitania – sunk off Cork in May 1915 – was the most famous casualty of the German blockade. With the appearance of The Huns of the North Sea in Ireland at the end of January, Sidney Morgan and John Payne’s P&M’s Films offered Irish audiences a way of imagining the new forms of warfare at sea involving minefields and submarines. The “short two-reeler, dealing with the mine-laying […] should prove exceptionally attractive to halls situated in the North of Ireland, where the mine-field was lately found” (Paddy, 21 Jan.). Whether through live music or engaging and relevant images, the cinema a century ago continued to draw the attention of the public. “The All-Picture Programme: Where “Variety” Is Not Wanted.” Bioscope 21 Sep. 1911: 591. “The Bohemian.” Evening Telegraph 26 Jan. 1915: 2. “City Cinemas: Question of Music Licence: Prosecution: In the Dublin Police Courts; Mr. Mahony’s Decision.” Evening Herald 30 Dec. 1914: 3. “Dancing and Singing: City Picture House’s Application: Described as ‘Novel. '” Evening Herald 23 Oct. 1914: 4. “Jottings from Ulster.” Bioscope 28 Jan. 1915: 339; 4 Feb. 1915: 437; 4 Mar. 1915: 837. “Music in a Cinema: Interesting Dublin Case: ‘To Drown the Noise.’”Dublin Evening Mail 26 Feb. 1915: 5. Paddy. “Pictures in Ireland.” Bioscope 21 Jan. 1915: 263; 25 Feb. 1915: 741. “Theatre Royal Hippodrome.” Evening Telegraph 6 Feb. 1915: 6. “Variety Artistes in Picture Theatres.” Bioscope 19 Nov. 1914: 707. “Variety Turns in Picture Theatres.” Bioscope 17 Dec. 1914: 1288. “War Pictures in Kinemacolor.” Dublin Evening Mail 4 Feb. 1915: 6.